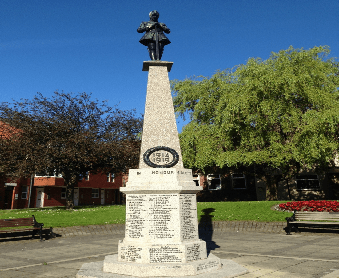 The Town Council is responsible for the War Memorials at Cramlington Village and at East Hartford. In the centre of Cramlington Village is the cenotaph to the fallen of The Great War. All names on the memorial are men from the Cramlington areas and many died of wounds and diseases after the majority of the fighting had ended. The statue of St George resting on his sword was unveiled 17th September 1922 and was created by Maragret Wrightson at a cost of £770 and features 152 names.